Chongqing Lifan has denied reports that Andres Iniesta was joining the club as a player. 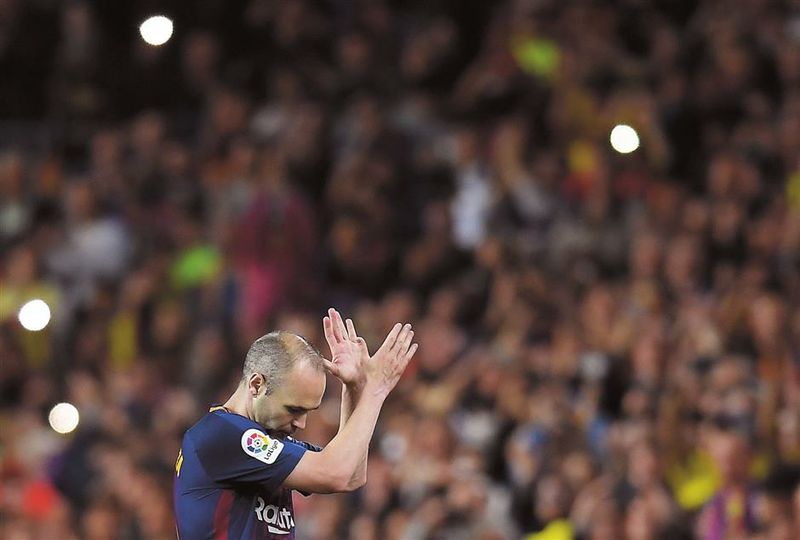 Barcelona midfielder Andres Iniesta acknowledges fans as he is substituted during the Spanish league match against Real Madrid at the Camp Nou stadium in Barcelona on Sunday. The Spain star has been linked with a move to Asia. Chongqing Lifan has denied reports that Andres Iniesta was joining the club as a player, though the Chinese Super League side said the Barcelona captain has “deep cooperation” with the club’s shareholder company. “Recently there has been news about Spanish star player Iniesta joining our club with a high salary guaranteed. We have 3 statements to make on this issue,” the club wrote on its official Weibo account late on Monday. “Firstly, our business philosophy has always been to insist on rational investment and reject money-based football so as to achieve sustainable development. Our club would not go against the evolving vision of Chinese football, and would contribute to its healthy development. “Secondly, our club invests in building a youth system so as to produce talents for Chongqing and China. Anything that goes against the Chinese Football Association’s policy or disturbs the market order would not be in line with our development perspective. After confirming his departure from Barcelona, his boyhood club, at the end of the season, the 33-year-old Iniesta has been strongly linked with a move to the CSL. The midfielder visited Chongqing last month to promote his wine brand, which was followed by reports claiming his potential new club would assist him in his personal business. Chongqing head coach Paulo Bento said at the end of last month that the reported move was simply a rumor. However, latest “rumors” surfaced on Monday when domestic reports, citing an unnamed Spanish media, claimed that Iniesta would accept a 3-year contract offer from Chongqing, worth 81 million euros (US$96.5 million), which would make him a player and a partner of the club. The reported salary would have made Iniesta the best paid player in the CSL. The CFA has been pushing through policies to prevent clubs from overpaying when buying new players for short-term gains. In 2018, a CSL club would have to pay the CFA the same amount of money it lays out in transfer fees when it spends more than 45 million yuan on buying a foreign player or 20 million yuan on a domestic player. Chongqing issued the statement in a gesture to scotch the reportedly big-spending tendency. Chongqing is the second CSL club to rule out a move for Iniesta, after Tianjin Quanjian threatened legal action to quash reports linking it with the player. Meanwhile, Japan’s Vissel Kobe, named in Spanish media as a possible next club for Iniesta, had no comment yesterday. Chongqing, with 11 points, currently sits 10th in the 16-team CSL table, which is jointly led by Shanghai SIPG and Shandong Luneng on 19 points.